Have you ever wondered how we make teeth look so perfect? Usually, in cosmetic dentistry, there is a process to set up any case for success. Now with Propel Orthodontics, this speeds up the process tremendously! Every time a patient comes in for a consult with Dr. Emery for cosmetic dentistry or veneers, we always have to let them know their options to achieve a perfect smile. For veneer cases, it’s ideal that the teeth are positioned correctly to place veneers on them. We recommend this because sometimes what the patients see is the rotation or crowding of the teeth that is the issue, and veneers being the answer. Veneers can be the answer afterward, but having orthodontics first will be sure to put the teeth in the correct position. An Invisalign case can span anywhere from 5-40+ trays. The case below was 24 trays. Without Propel, this would take about 1 year. With Propel, it only takes 2 1/2 months! If you look at the patient below, you can see that her front teeth do have a few issues at first. Instead of putting veneers on everything and having the teeth misaligned, we recommended Invisalign first to bring down her canines and expand her collapsed arch. At this point, the patient was happy with her smile except for the two front teeth. These teeth have large bondings on them that has been done several times over the years. The best way to solve this problem is to place strong veneers in place of the composite. Look at the amazing natural results! 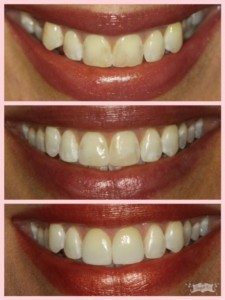 Timeline- Before, after Invisalign, and after veneers! 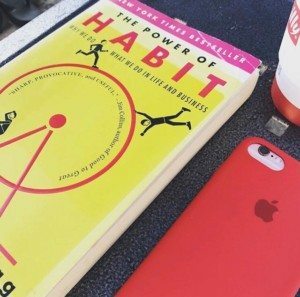 This week we also had our book review of “The Power of Habit”. What a great read to do for the end of year! I think all of us at Sugar Fix have set some amazing goals to achieve in 2017 and this book helped us to realize they are achievable! We highly recommend it! That is it for this week! Until next time!